Good news! Personal Capital supports Roth IRA accounts! Check them out here. 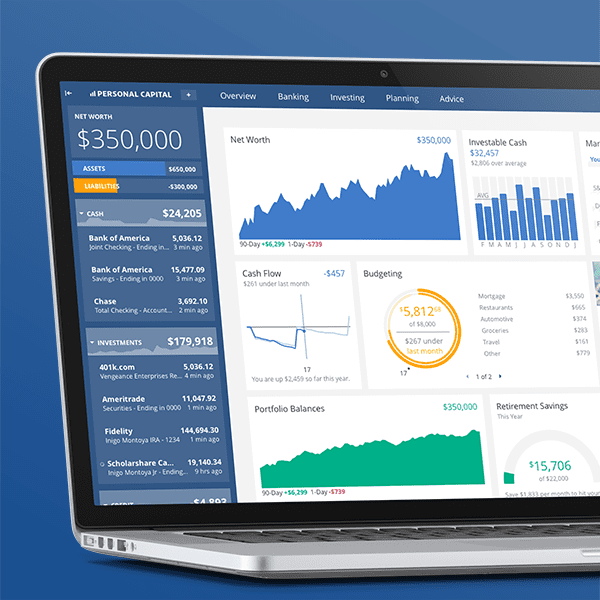 Personal Capital has one of the biggest selection of free services in the robo advisor market, including a popular asset dashboard that's even more detailed than Mint which keeps track of your net worth. The free retirement fee analyzer can uncover hidden fees that can potentially cost you hundreds of thousands of dollars over your lifetime, and makes signing up for a free Personal Capital account a no-brainer for anyone with a 401(k) or IRA. You can also upgrade to a paid advisory service which give you access to a financial advisor if you prefer a human touch in addition to automated rebalancing and asset allocation. The idea behind Personal Capital is to give you an overview of your entire financial picture, looking at all of your assets, while at the same time allowing you to track day-to-day transactions. 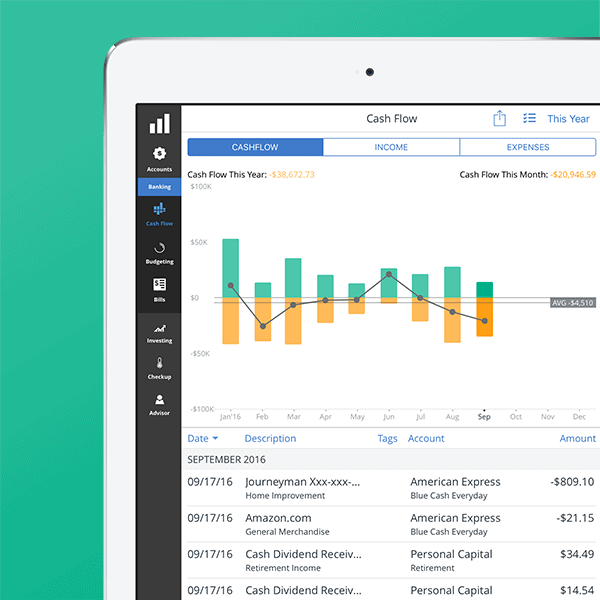 Like many other personal finance software programs, the personal capital app can import your financial data directly from the institutions you use, whether they are banks or investment brokers. You start by opening a free account at Personal Capital. You can do this quickly and easily by entering your email address, creating a password, and sharing your mobile number. (Your number is supposed to be used for verification purposes.) You can quickly and easily link your bank, credit card, loan, mortgage, cash, and investment accounts. There is a personal capital app for your smartphone, as well as the web-based app. All of this is quickly and easily accessed, allowing you to dig deeper into certain aspects of your finances, without the need to move from website to website. Not only can you see everything in one place, but you can plan ahead using Personal Capital. It’s possible to set up bill reminders and see what is due in the future. As a result, you can enjoy more effective planning, and see what is next for your finances. No Personal Capital review is complete without a look at some of the other services offered by the app. One of the most interesting (and free) services offered is the Retirement Fee Analyzer. The retirement fee analyzer alone makes signing up for a free Personal Capital account a no-brainer for anyone serious about their investments. Another great feature of Personal Capital is its Retirement Planner. Using your information, the Personal Capital app can help you plan around with different scenarios and adjust your savings and investing so that you reach your retirement goals. It’s a handy free tool that helps you evaluate your needs, and get realistic about what you need to do in order to retire comfortably. Personal Capital also offers a premium advisor service. You can be assigned an advisor who will help you create a long-term financial plan. Additionally, there are asset management services available through Personal Capital. One of the downsides to signing up to use the Personal Capital app is that you might receive calls from your “advisor,” trying to upsell you to the premium paid services. You can stop the calls by asking, however. Because you are providing a lot of sensitive financial information, you want to know the answer to the question, “Is Personal Capital safe?” The reality is that Personal Capital is quite safe. Harris, has more than two decades of experience in the financial technology sector, and has been involved with security. As a result, there is high emphasis on security. In fact, Fritz Robbins, the CTO of Personal Capital, likes to point out that it’s probably safer to use Personal Capital to monitor your financial transactions and accounts than it is to log in repeatedly to different institutions. Additionally, you can’t actually initiate transactions from Personal Capital, so if someone actually made it into your account, s/he couldn’t move any of your money around. Personal Capital is a great money management and planning tool that allows you to get a big-picture view of your finances, plan for the future, and see how your day-to-day transactions affect your overall money situation. It’s a solid tool for those who wish to integrate their finances more fully and see everything from one dashboard. It is also an invaluable tool that helps you build a better portfolio and reduce investment fees. Ultimately, this is the biggest reason anyone serious about wealth building needs a Personal Capital account. Personal Capital’s free tool offerings are comprehensive, intuitive and enlightening; it outsteps competitors like Mint when it comes to investing insight, and most consumers could benefit from an account. DIY investors can use the asset allocation and fee analysis tools to check their work, then make changes to reduce expenses or improve performance on their own. Beyond that, the paid advisory service is a harder sell, but investors who want to toe the line between a financial advisor’s high management fees and a robo-advisor’s low-touch approach could certainly find a home here. I wished for a service that focused more on the investing side of personal finance: retirement, asset allocation and taxes. I discovered Personal Capital over four years ago, and it appears to have answered most of my wishes. I love the free services provided by Personal Capital. They offer a lot and ask for nothing in return. I wouldn’t pay for their investment advice, but their fees are comparable to many financial advisors, so I’ll leave that up to you. If you want a completely free tool to use to manage your overall finances Personal Capital is a great option to try out. The one knock against Personal Capital is the platform does not offer any budgeting help. If you want/need a financial advisor, they do have trained advisers who are assigned to your account and they make it easy for you to sign up for a call or instant chat with an adviser from the site. When I signed up for my account, one reached out to me but it was not a service I took advantage of as I knew I’d not be paying for professional advice. In an industry filled with fees and expenses, you can’t argue with receiving something for free. That’s the case with Personal Capital as they allow you the ability to receive free, ongoing, portfolio reviews as well as watching all your online brokerage accounts in one location. Yes, you do have the ability to work with a financial advisor but that is not a requirement to use the platform. Personal Capital offers one of the most comprehensive pictures of your financial situation, a more complete picture than some other sites like Mint.com are able to offer. If your financial picture includes multiple investment accounts, and a variety of other accounts, Personal Capital can help you manage everything, since it is more than a budgeting app; it’s a true money management app. Personal Capital is a great company with incredible tools. However, their pricing structure does leave a bit to be desired. When it comes to pricing, the top notch investors pay the least which, is expected. But, with this model, I would say that Personal Capital is really designed for the big timers. Personal Capital uses technology to create a more transparent and affordable financial services experience. While the typical mutual fund expense ratio is 1.16%, Personal Capital is able to provide investment advice, portfolio management, custody, and trading fees for one all-inclusive low fee, which varies depending on the amount of money invested with the firm. Personal Capital is a must have service for all serious investors; the retirement planner is priceless, helping turn an abstract idea like retirement into an actionable goal. 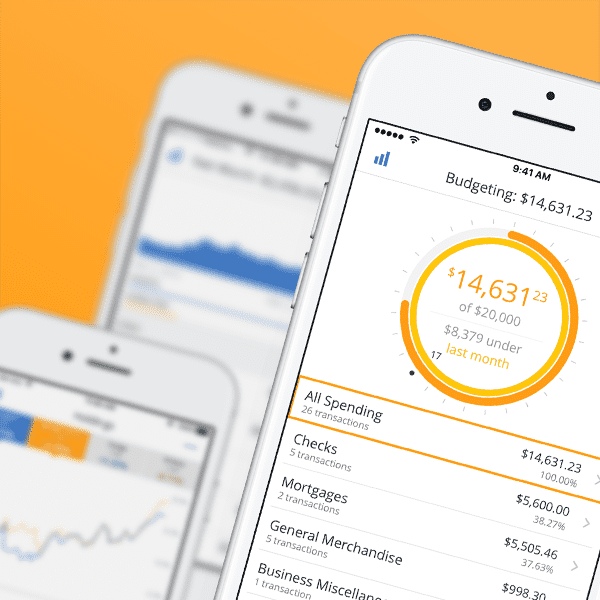 Imagine having all of your expenses, income and investing data all in one place. You can quickly pull up how much you spent on entertainment last month (or last year!) or figure out your top dividend paying investment. They even have options to tag transactions to help you sort out your deductible expenses at tax time. 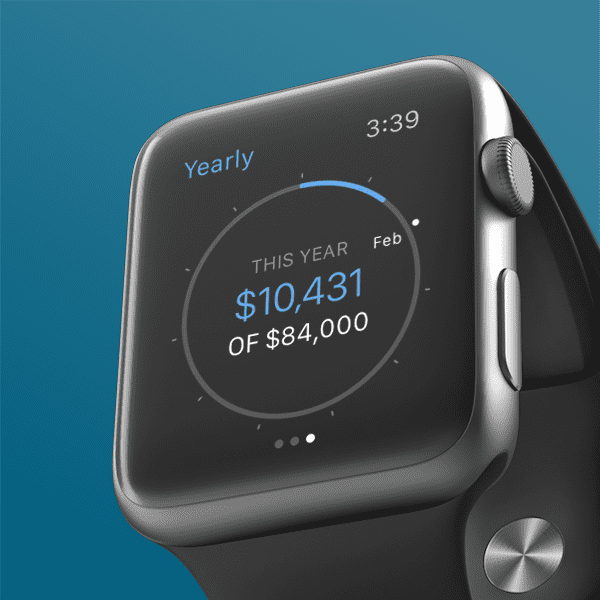 Overall, it’s a great app that can revamp how you run your financial life and doesn’t require a big time investment up front to get you going.